A marvelous reference! 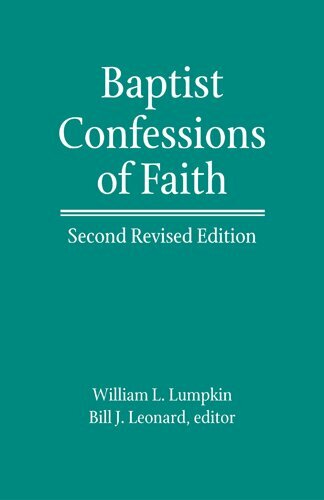 Features every significant Baptist confession from early 17th-century forerunners through the latest Southern Baptist revisions. Includes works in English, German, Swedish, French, Russian, etc. All have been scrutinized in light of the latest research; their meaning for the Christian life today is spelled out. William L. Lumpkin (1916ï¿½1997) was longtime pastor of Freemason Street Church in Norfolk, Virginia. He also taught religion at the University of Richmond and served as Associate Professor of Church History at Southern Baptist Theological Seminary in Louisville, Kentucky. His other books include 'Colonial Baptists and Southern Revivals'. Bill J. Leonard is dean and professor of church history at Wake Forest University Divinity School. He is the author or editor of fourteen books, including God's Last and Only Hope: The Fragmentation of the Southern Baptist Convention, Christianity in Appalachia: Profiles in Regional Pluralism, and Baptist Ways: A History. His work is often cited in the media, and he appears frequently on NPR and other radio and television stations. In 2007, he was awarded the W. O. Carver Distinguished Service Award from the Baptist History and Heritage Society.